The first thing you need to know is that there are five ways that you can get involved with StoryBrand for yourself, from reading the book through becoming a guide. I’ll go through them below. The first option is to just buy the book on Amazon. It does a great job covering what the StoryBrand approach is all about, gives some historical grounding, and covers the importance of each step in the StoryBrand framework. If you prefer a do-it-yourself approach, you’d probably start here. This is a book about StoryBrand… it’s not the same as creating a StoryBrand. It’s full of useful information and a relatively easy read, but it’s akin to a book about swimming – no amount of reading is going to keep you afloat in a pool until you get some experience with the concepts through action. 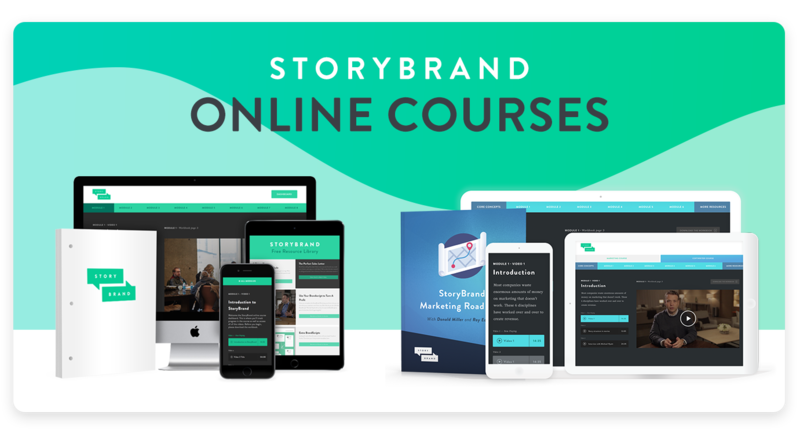 The next level toward mastering StoryBrand – for yourself or toward becoming a guide would be the StoryBrand Online course. As of November 2018, the course is going through a major overhaul, so this is about the prior version. Plain and simple, the course is fantastic. Yes, it has much of the same content as the book, but it’s broken up into a large number of bite-size segments from 5-20 minutes in length. If you just binge-watch them, I think you’ll miss the value. Instead, watch one segment, then immediately start making lots of notes about how to practice or apply the concepts you just learned in your own business. I got easily 1-2 pages of implementation notes from almost every video. These were possible directions that I could use when I later built a BrandScript for myself. The hard part comes later when you realize that for each and every part of the StoryBrand seven-part framework (SB7), there are multiple ways it can go. Eventually, you’ll have to pick and choose what to say from each part of the framework. For now, just make lots of notes and keep going. The course comes with a 30-day money back guarantee and optional payment plans. That’s more than enough time to go through the entire program and realize the value of the StoryBrand framework for your own business. Best of all, the course is half the cost of the live workshop, and there are no travel or lodging expenses to deal with. And at least when I checked last year, they would apply the cost of your online course toward the live workshop for up to a year if you later wanted to upgrade. Back to the swimming analogy, this is like watching people swim with great expertise. You have what you need to try to model what you see, but it’s still no substitute for getting in the pool. However, if you have any doubts or reservation about the live course, then do start with the StoryBrand Online course. The live, 2-day workshop is about $3,000 and it includes the online course. Plus, if you bought the online product within the year, they apply that as a credit toward the live program. (Check with StoryBrand to see if they still honor that.) Personally, I think you’ll get much more from the live class if you already went through the online product. 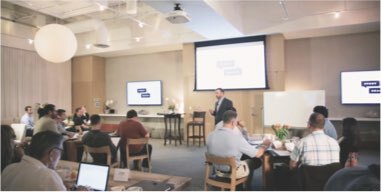 This is not a case of listening live to what you just watched… the live class has work-sessions built in that add structure to actually DO THE WORK. Plus, getting feedback from somebody else on whether they think your message is clear is huge, since we all suffer from the curse of knowledge. Repeatedly, for text that I thought was crystal clear, my partner was confused. I had the same experience with him, and that’s actually a massive benefit. Together, we both helped each other get greater clarity, which is the goal of the program. Additionally, the live program is well staffed to have professional guides answering questions, reviewing your work, giving expert feedback, and also encouragement. It can be discouraging to be so close to your business only to realize you don’t yet know how to describe it to a stranger. The guides help normalize your experience and move you forward to the next step in the process. Don and his team are great presenters, and it’s really the dedicated structure and personal hand-holding through the process that makes the live program worth the extra time and expense. Click here to see when and where the next live program is being offered. Guide training is about $10K. Typically, it’s an extra 2 days immediately following the live training workshop. It builds on the live training in several ways. First, it focuses on the common pitfalls people experience when building their own BrandScript, and how to spot and fix them. Second, it builds a bit of a community in the class, where people with different skills can help each other. Third, and this is the cool part, there is practical work to perform with a fictitious company. You are broken into a group of about 5-7, given the fact patterns for the companies, and as a group, you have to perform all the work to design a full BrandScript, create the wireframe for a website, write a sales-letter email, and write the headings for the next 5 emails in a marketing campaign. The point is that real work is involved to use what you’ve just learned and refined over the past 4 days. Finally, each group presents their work to the other guides-in-training and the staff present detailed feedback. It’s not competitive but rather designed to showcase different approaches and foster greater learning and retention of what we’ve been working on together. This was huge for me, and actually highly enjoyable. Of course, typical aspects of teams come into play (norming, forming, storming, performing), as well as time-management, but in every way the exercise and experience were worth it for me. The certified guide program is unlike many other programs where you get some content, take a test, and then you are “certified.” There’s also a 90-day onboarding process that continues to deepen your knowledge, answer questions, provide feedback, and adds some level of group-accountability. This onboarding group meets every 2 weeks for 60-90 minutes, focusing on guides doing the work on their own site and profile to make the program profitable. The program’s goal (not a promise) is that all guides make back 10X their investment within the first year. In my own case, I made back $6,500 in my first 3 months of being listed on ClarifyYourMessage.com, which is the official site for all certified guides. From other guides, I’ve learned that the “StoryBrand” keyword has been highly effective with Google AdWords (Turn it on for a week, get booked, turn it off, repeat), though I have yet to turn that on for myself. Personally, I am already a certified partner with both Infusionsoft and Digital Marketer. Without question, StoryBrand’s onboarding program and support have been the most comprehensive so far. Mind you, the first two were big from a LEARNING perspective, but the StoryBrand’s onboarding represents exceptional customer service and is why I recommend it wholeheartedly. If you’d like to have a conversation about any aspect of StoryBrand – from creating a StoryBrand script for your own brand to joining the guide program – please feel free to contact me or schedule a time to chat. I am seriously considering the StoryBrand Guides program. I am curious how successful the past 6 months have been. What else have you learned? Are there pitfalls or difficulties have doing guide work that are hard to see from the outside? Hi Ashley! Thanks for sharing your experience with the guide certification. I am also strongly considering it. I’ve owned an online business for a long time in an unrelated niche and would like to transition into web design and web copy/business messaging – I already know a lot about marketing, but I loved the way Storybrand puts it together! Long story short, I know I could work with people on web design and marketing in a similar fashion without being Storybrand certified, but then of course I need a source of leads. Obviously the guide program is a huge investment but I’d be more than willing if I knew it was worth it in terms leads coming my way. How often do people reach out to you via the website and how often do those turn into clients? Is it your main source of leads? Could it potentially be the only source of leads that you’d need to keep your business running and make a good living? Guides get a listing on the ClarifyYourMessage.com site, which lets people contact guides directly. However, my own experience is that people may find me over there, but then they go directly to my site and request a conversation rather than filling out the lead form. My web traffic shows a moderate amount of traffic coming from the guide directory. It’s up to you how much you flesh out your page, and the more you do, the better it will perform. The bigger source of leads for me is other guides. They have a good community there and people help each other, as well as referring to each other.